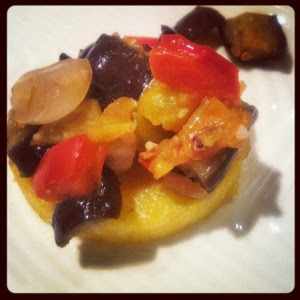 I made a yummy Eggplant Caponata, using the eggplants I purchased at the Little Italy Farmer's Market. It was delicious, and was even better the next day for lunch! 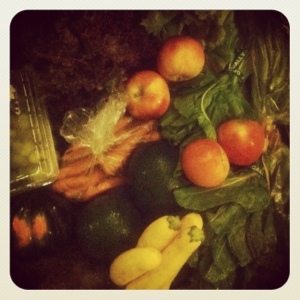 I picked up my first CSA box from J.R. Organics. It was packed with 2 huge heads of lettuce (romaine & red leaf), chard, sorrel, yellow squash, 2 acorn squash, 2 HUGE Reed avocados, carrots, green beans, okra, apples and grapes. That's a lot of produce!! My birthday was on Friday, so for birthday dinner before a game night we headed to the Loving Hut in Mira Mesa. A 100% vegan restaurant with really good food. We got the Texas Fries and Loving Strips. We also got the Strawberry Milkshakes. Everything was great!! After dinner we headed over to the Cobb's house for some birthday festivities. Games, friends and a cake which Rob had decorated special, just for me...lucky me! Saturday I headed over to the Gonzalez house after bible study to cook up some freezer meals. We had a routine where we were doing this regularly, then summer came along and we all got extra busy and stopped. So this was our first cooking weekend in a long time. We did it proud!! We prepared Taco Soup, Pasta Fagioli, Wild Rice & Mushroom Soup, Marinara Sauce, Pesto Sauce, Alfredo Sauce, Aloo Gobi, Tamale Pie, Texas Hash, Shepherds Pie, Vegetable Pot Pie, Kofta Balls and Masala Veggie Burgers. AMAZING!! Our freezers are stocked for a month with easy, healthy, vegan meals!! Sunday night after church we headed over to Lyle's house for dinner and Amazing Race. I made a Apple Blackberry Crisp....yum!! I used the apples from my CSA box. Last time I joined a CSA I let too much of the produce go to waste, this time I am determined to use every bit of it!! It was a great week, and I'm looking forward to this one as well! Tonight I'm making Mardi Gras Gumbo using the okra and carrots I got in my CSA box. See ya!